Galley Wench Tales: Mc French? This billboard was prolific on the Eastern half of Guadaloupe. While I wonder if French Fries (or pomme frites as they would call them in France) are truly a French versus U.S. creation, the hamburger here is definitely considered “American” (typically United States – though I do not like to forget our Canadian neighbors to the North, nor Mexico, Central America or South America to our South) food. A side of fries commonly accompanies it here, too. Still, McD’s (aka “Mickey Ds” or McDonalds) knows its customers, and they know their tastes shift. There are regional favorites to add to the menu to be considered a local favorite. In Fort Du France when nearly everything was closed for holiday and the weekend, we were desperate enough to inhabit a McD’s for internet access. I noticed the mango shakes. Now I don’t much go to McD’s in the U.S. so can’t say for sure if mango shakes are on the menu there, but betting not. 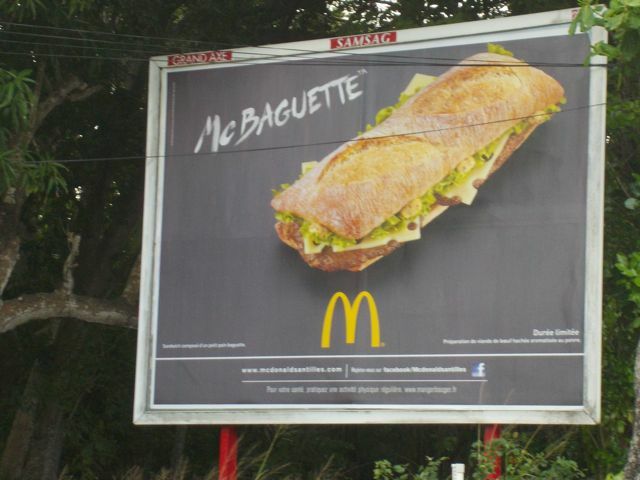 Still, we’re not quite sure why McBaguettes gave us such a chuckle, but they did. Actually, if they had them in the U.S., we would be more inclined to consider them as something other than a desperation stop. Galley Wench Tales’ purpose is to explore native food and its impact culture. For better or worse, it’s clear cheap, international fast food chains are as much or part of the landscape as traditional “native” foods. 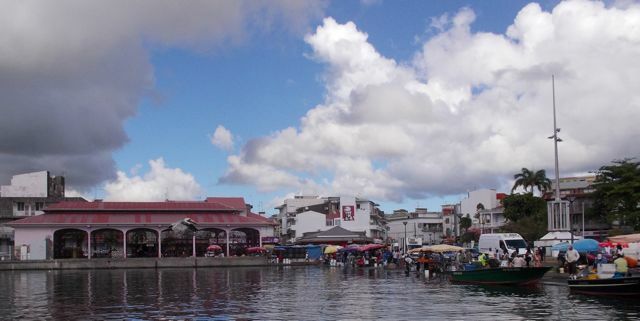 Old and new… foreground is PointeAPitre’s fresh fish and produce market. Notice the KFC “logo midpoint on the white building? If you travel the Caribbean, you will not suffer burger and fries withdrawal from McD’s, Kentucky Fried Chicken or Domino’s pizza. Burger King periodically pops up as well. A Coca Cola on the side can be had nearly anywhere. Coke’s distinctive logo is part of the fabric of even rural Caribbean landscapes, but Pepsi products are about as scarce as U.S. beers (Wayne practically felt like he died and went to heaven when Bailey's Market in Antigua had a couple Diet Mountain Dews from PepsiCo). If I do frequent non-native fast food, I’ll be looking for what makes it local. And billboards, well, well, they’re calorie-free. 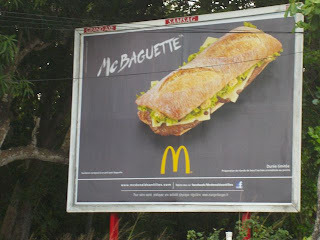 Steve from Ocean Star tried a McBaguette and said it was awful. Guess I didn't miss anything after all.